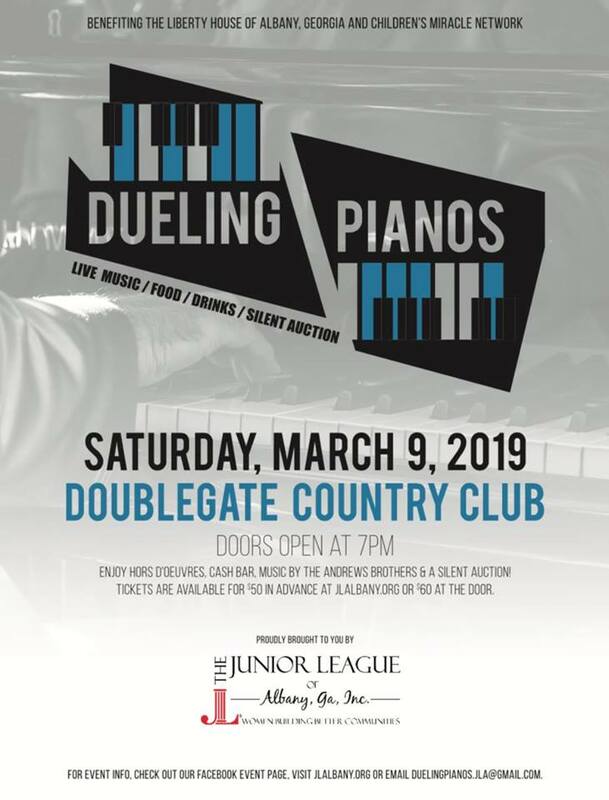 Join us for Dueling Pianos on Saturday March 9, 2019! An exciting and entertaining event held by the Junior League of Albany, Ga, Inc. Tickets are $50 in advance or $60 at the door. Doors open at 7:00. We will have live music by the Andrews Brothers with delicious food and a cash bar. Don’t forget to stop by our silent auction filled with great items! Dress in your best cocktail attire and come prepared to have fun and dance the night away. We can’t wait to see you there! Proceeds from this event will benefit the Liberty House of Albany and Children’s Miracle Network! The Liberty House works toward the elimination of domestic violence in our community by providing emergency shelter, advocacy education, awareness, community resources and collaboration to ensure that all victims are empowered to achieve self-sufficiency. Children’s Miracle Network provides funding for specialized equipment, education, and programs that benefit our NICU babies and pediatric patients treated at Phoebe. We hope you will attend and support this event to make a lasting impact on our community!